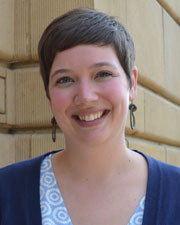 Heather Anderson is the Assistant Director of the School of the Arts within the College of Liberal Arts & Sciences. She leads the communications and promotional efforts for the School of the Arts, including public relations, event marketing, and writing and disseminating news about the School. She also develops and executes the overall marketing for the School of the Arts through print, electronic and social media, advertising and media relations. Before joining the School of the Arts, Heather worked as the Communications and Events Coordinator for the Dole Institute of Politics at KU. She is a Jayhawk twice over, receiving both a B.A. in history of art and a B.S. in journalism from the University of Kansas.